Today, I'm reviewing Warner Archive's new Blu ray release of Bad Day at Black Rock (1955), starring Spencer Tracy. Here's what you need to know about Bad Day at Black Rock (1955), which was just released on Blu ray by the good folks at Warner Archive. The Stars: Spencer Tracy; Robert Ryan; Ernest Borgnine; Lee Marvin; Walter Brennan; John Ericson; Anne Francis, and Dean Jagger. Source Material: A 1947 short story, "Bad Time at Honda" by Howard Breslin. Awards: Bad Day at Black Rock was nominated for three Academy Awards: best actor for Tracy, best director, and best screenplay. Tracy won the best actor prize at the Cannes Film Festival. Bad Day at Black Rock was also one of the National Board of Review's top ten movies of 1955. Plot: Bad Day at Black Rock tells the story of John J. Macreedy (Tracy), a mysterious man who arrives unexpectedly one day in the small desert town of Black Rock. Macreedy is greeted with guarded suspicion at first, but when he begins asking about a Japanese farmer named Kamoko, a powerful rancher (Ryan) and his hired thugs (Marvin and Borgnine) begin a campaign of intimidation that threatens Macreedy's life. Backstory: MGM purchased the rights to Breslin's short story with the idea of casting Joel McCrea in the lead, but those plans quickly fell apart over concerns about the controversial nature of the subject matter (the script was seen as a veiled criticism of McCarthyism, and the disgraceful internment of many Japanese Americans during World War II was not yet widely known). 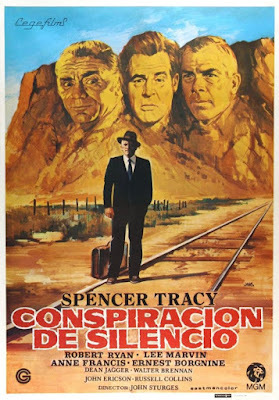 However, MGM chief Dore Schary, who was known for his fondness for message movies, loved the script, and finally got it made with MGM stalwart Spencer Tracy in the lead. Spencer Tracy and Walter Brennan in a lobby card for Bad Day at Black Rock (1955). Location: Bad Day at Black Rock was filmed in the Alabama Hills near Lone Pine, Calif. The spot has been a popular Hollywood location since the days of Tom Mix Westerns, and more than 150 movies were made there. The town of Black Rock was specially constructed for the movie, and then taken down once filming was completed. 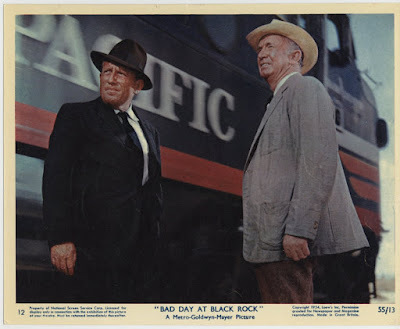 Best Performance: Bad Day at Black Rock is filled with great performances from several old Hollywood stalwarts, especially Dean Jagger as the weak-willed sheriff and Marvin as yet another vicious thug, but the movie simply would not succeed without Tracy in the lead role. He gives Macreedy a quiet dignity and force of character that somehow obliterates all of the blustery rage around him. 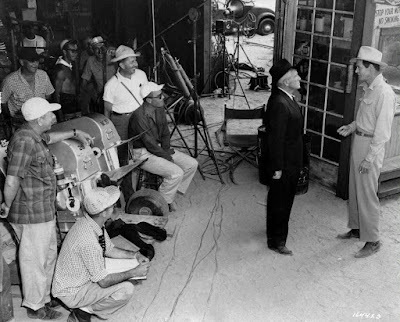 Spencer Tracy and Robert Ryan film a scene from Bad Day at Black Rock (1955). Director John Sturges is seated with sunglasses. Best Scene: Macreedy unleashes some unexpected karate skills in a tense scene in the town diner. Best Line: "You're not only wrong, you're wrong at the top of your voice." -- Tracy in a tense exchange with Borgnine (clip below). Fun Fact: According to government records, Bad Day at Black Rock is one of the most frequently screened movies at the White House. The Critics: Bad Day at Black Rock has a 97 percent fresh rating on Rotten Tomatoes, and Leonard Maltin praises the "powerhouse cast" in a three and 1\2 star review for his Classic Movie Guide. Remake: In 1960, MGM dusted off Breslin's short story for the B movie, Platinum High School. The desert setting was swapped for an exclusive boys school on a remote island. Concerned father Mickey Rooney gets a cold reception from principal Dan Duryea when he comes to investigate his son's mysterious disappearance. 1. The message. Bad Day at Black Rock's message of courage against the odds and tolerance were certainly meaningful to fifties audiences, but they are perhaps even more revelant in our age of "alternative facts" and xenophobia. 2. The direction. Sturges was known for his exciting action sequences in movies like The Magnificent Seven (1960) and The Great Escape (1963), but he was always most proud of his work on Bad Day at Black Rock. The director masterfully ratchets up the tension to almost unbearable levels using little more than spare dialogue and desert scenery. 3. The Performances. The movie has great acting all around, especially from old Hollywood veterans Tracy, Jagger, and Walter Brennan, and the always underrated Robert Ryan, who plays a villain for the ages. Availability: Bad Day at Black Rock is available on Blu-ray from Warner Archive (link below). TCM will air Bad Day at Black Rock at 1:15 p.m. March 10. It is also available on DVD and video on demand. A powerhouse drama, many call this a western, I don't though. Tracy earned yet another of his all 9 leading actor *Oscar nominations as John J. McCreedy. The rare picture that is too short at just 81 minutes. 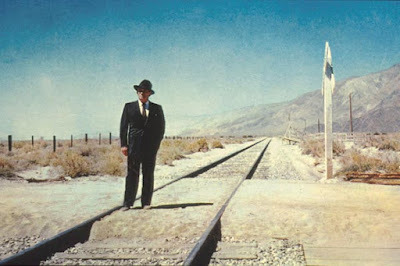 John Sturges also was up for BD Shot in Lone Pine, CALIF-(also where "Gunga Din" (l939) had been shot.